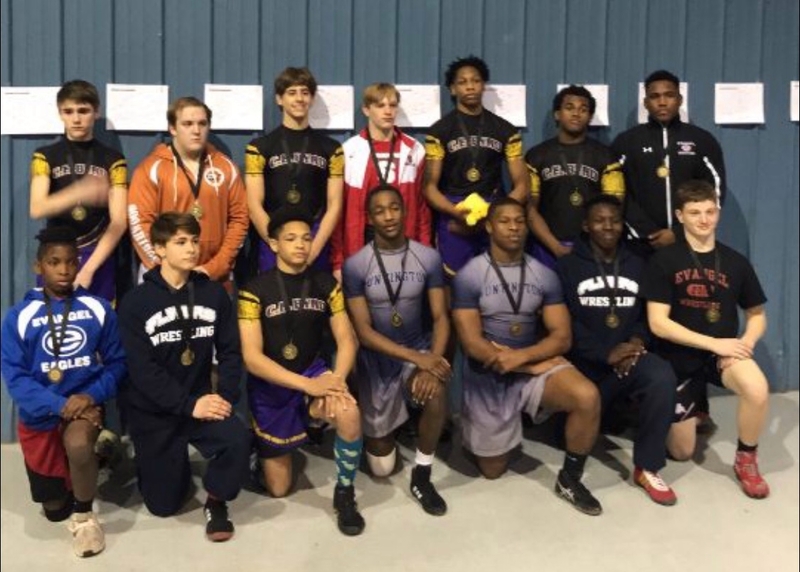 On Monday, February 5th, seven schools from the Greater Shreveport area met at Evangel Christian Academy to determine the Shreveport areas's best wrestling team. C.E. Byrd High School, the sole Division I school of the group, won the event with 174 points. Following the Yellow-jackets were the host Evangel Eagles with 117 points. Third-place was a heated contest between Caddo Magnate and Northwood, won by Caddo Magnate by one point, 89-88. Huntington placed fifth with 67 points, followed by Loyola College Prep. with 40 points, and Summerfield with 21. Byrd won the team championship and five individual titles. Yellow-jackets champions were Matthew Born at 113 lbs., Demetri Teddlie at 126 lbs., Jacob Yawn at 132 lbs., Cordray Tolliver at 160 lbs. and Anassas Anderson at 195 lbs. Three Evangel Eagles won championships in their home gymnasium: Jarius Wilson at 106 lbs., Kaden Dean at 170 lbs. and Trey White at 285 lbs. The Huntington Raiders had two champions in Derick Ferguson at 138 lbs. and Christopher Washington at 182 lbs. Also with two championships, and only two wrestlers, was Loyola College Prep. James Beckman at 120 lbs. and Donnie Scott at 152 lbs. won titles for the Flyers. Zachary Biggs won a title at 145 lbs. for the Summerfield Rebels, as did Richard Marlowe for the Northwood Gators at 220 lbs. Back row, left to right: Matthew Born (BYR), Richard Marlowe (NW), Jacob Yawn (BYR), Zachary Biggs (SUM), Cordrwy Tolliver (BYR) and Anassas Toliver (EVA).